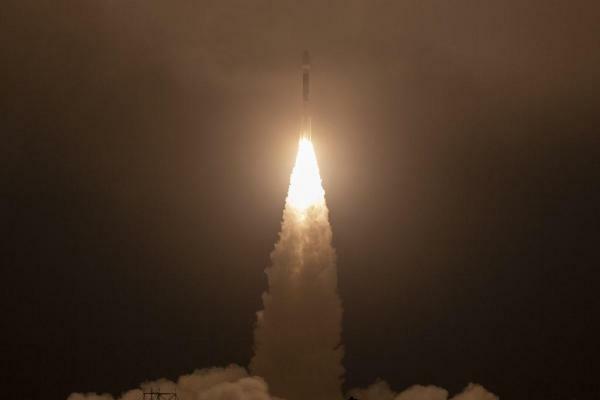 Sept. 15 (UPI) — NASA’s newest ice-measuring satellite was launched into orbit around Earth’s poles on Saturday morning aboard the last flight of United Launch Alliance Delta II rocket. ICESat-2 was carried into space at 6:02 a.m. PDT from California’s Vandenberg Air Force Base, NASA said. The scheduled time was 5:46 a.m. but it had a 40-minute launch window. The spacecraft deployed its four solar panels and is drawing power, meaning it successfully went into orbit. It is orbiting the globe, pole to pole, at 17,069 mph from an average altitude of 290 miles. Ground stations in Svalbard, Norway, acquired signals from the spacecraft. The official name is NASA’s Ice, Cloud and land Elevation Satellite-2. ICESat-2’s only instrument is a laser system designed to measure the height of Earth’s surface — most importantly, sea ice’s height. The sea ice’s height will help scientists measure its thickness. Because the satellite’s instrument can shoot six laser pulses — not just one — at high speeds, ICESat-2 will be able to observe changes in sea ice coverage and thickness in unprecedented detail. Scientists will be able to combine the new ice-related data with measurements captured by a variety of other satellites and instruments, helping scientists uncover hidden relationships between ice and other ocean and atmospheric phenomena — wind, current, temperature, precipitation and more. In addition to measuring minute changes in sea and land ice, ICE-Sat-2 will use its height-measuring lasers to track sea levels, ocean waves and forest canopies. The launch was ULA’s Delta II rocket’s 153rd success — and its last because ULA is retiring the model. ULA will have to rely even more heavily on its workhorse rocket, the Atlas V.